White House Press Secretary Sean Spicer really stepped on a yuge pile of poo with his enormous height of stupidity Holocaust analogy. Blogger thinks Mr. Spicer has finally cracked bigly under the pressure of the job. Sean, we understand. You have a highly stressful job and you were bound to lose it. Alright, on to today's subject-opioid addiction in the suburbs. Opioid addiction, like any addiction, strikes men and women, regardless of race, ethnicity, religion, socio-economic status, or place. Laura Bliss begins her CityLab article, "Even Healthy-Looking Suburbs Are Dying From Drugs," cites the example of Essex County, Massachusetts. On the surface, the historic suburbs on Boston's outskirts, do not look sick. The County has not been plagued by diabetes, obesity, or cardio-vascular disease. The County's residents are insured. Taking into account socio-economic factors that impact health, "...it should actually be in better-than-average shape: Nearly 38 percent of the population is college-educated. Only 11 percent live in poverty." So, you ask, what is the problem? 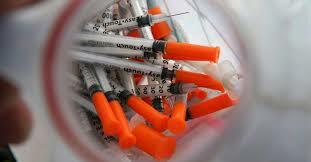 The problem facing Essex County is drug addiction is claiming lives at a rapid rate. This true not just in Essex County but other counties across the United States. Ms. Bliss reports, "In 2010, drugs were responsible for the deaths of roughly 11 out of 100,000 people countywide-a rate that nearly tripled to 31 by 2015, according to data from the Centers for Disease Control and Prevention (http://www.wonder.cdc.org). This deadly spike-powered by heroin and prescription painkillers-is part of the "national opioid addiction that's been growing for years." Essex County is the model for an "emerging geographic dimension of this crisis: Larger, suburban counties outside of major metros-..." These are places should be healthy by typical standards but are the places where drugs have claimed the most lives. At the end of March 2017, the Robert Wood Johnson Foundation (http://www.rwjf.org) released its 2017 County Health Rankings and report which analyzed county data from all 50 states, focusing on 30 public health results and behaviors. Ms. Bliss writes, "The report finds there's been a clear flip in the geography of addiction: One decade ago, large suburban areas experienced the lowest rates of premature deaths due to drug overdoses. In 2015, they had the highest." The Johnson Foundation study does not specifically which counties experienced the greatest increase in drug-related deaths. The study ranks every American county, according to each state, using information that presents local health conditions, such as diabetes and obesity, as well as gauges that can foretell health outcomes including teen pregnancies, smoking, and grocery store access. Laura Bliss writes, "Comparing those numbers to the Johnson Foundation report, I found startling disconnects between deadly drug problems and places that have an otherwise fairly 'healthy' facade." 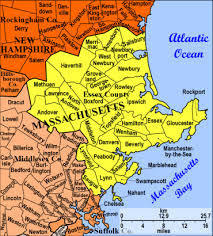 Returning to Essex County, it "ranks sixth out of the 14 counties in the Bay State [Massachusetts] by the new report-middle-of-the-road when it comes to chronic health conditions that normally wave red flags for public health researchers." Be that as it may, the number of drug-related deaths is growing at an alarming rate. On the outskirts of Cincinnati, Ohio, "Boone County, Kentucky, ranks first out of 120 across its state on all other health rankings. Like Essex County, Boone County has low rates, of diabetes, smoking, and teen pregnancies, poverty is kept down, and employment is solid. However, CDC data revealed that drug-related deaths jumped from 26 in 2010 to almost 46 in 2015. 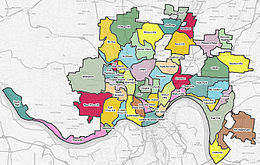 Clermont County is ranked in in the middle of Ohio's 88 counties and is part of the Cincinnati metropolitan area, saw a similar spike. Another case, Clay County, part of the Jacksonville, Florida metropolitan area comes in at number eleven of the state's 67 counties. However, drug-related deaths grew from 14 in 2010 to 23 in 2015. While these statistics seem grim, there was some positive news. Ms. Bliss reports, "Some suburbs appear to making improvements: for example, Paulding County, Georgia, on the edges of Atlanta, saw its yearly rate drop from roughly 27 to 16 from 2010 to 2015." 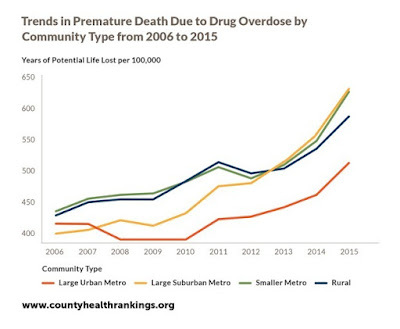 That aside, the Johnson Foundation study states that "premature deaths related to drug overdoses rose across community types-suburban, urban, and rural." 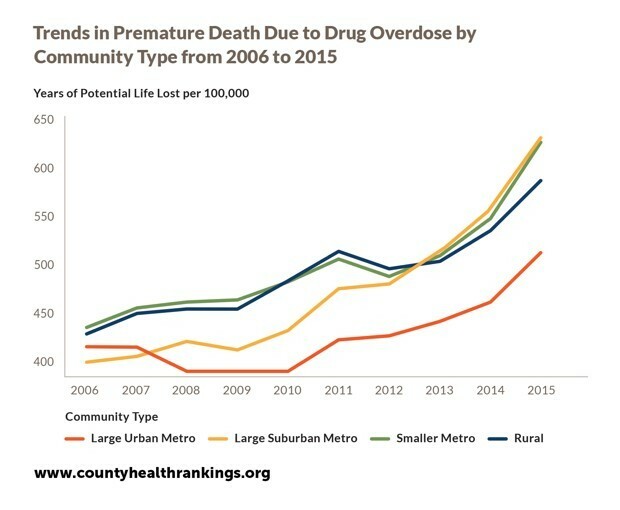 Healthy-looking counties monitoring opioids claim "an alarming number of too-young lives, they very highest rates are still found in some of the poorest, sickest parts of the country." For example, in 2015, McDowell County, West Virginia recorded 141 narcotics-related deaths-the highest in the United States. It was also ranked last in the the state's rankings ("West Virginia has been ground zero in the nation's opioid epidemic, largely due to a tragic confluence of economic factors). The Centers for Disease Control and Prevention reports "Drug mortality rates are notoriously shifty...they're likely undercounted in many countries due to unresolved cases and misclassification." The nationwide pattern is clear, too many young Americans are dying from drug addiction-"even in communities that otherwise appear healthy." Blogger Candidate Forum: "Bowling Alone"
Are The Suburbs Really Overtaking Urban Areas?